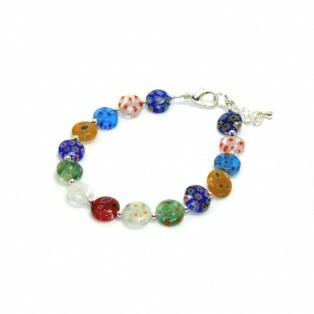 This bracelet has been made using multicoloured glass button shaped beads. Each one measuring 8mm. It will fit any standard adult wrist and has been fitted with an extension chain to make it longer if necessary. I have used "Nickel Free" silver plated clasp and chain to comply with EU directives. Millefiori Glass beads are manufactured on the Italian island of Murano. The floral patterns are very intricate and beautiful.